Rooter-Man GTA has a team of knowledgeable and skilled service technicians that can waterproof any basement, house, or building. Wet and leaky basements can occur for a number of reasons. For instance, water could be running into your basement through wall joints, water seepage via floor cracks, clogged or overflowing drains, water backflow caused by sewage backups and heavy rainfall, and concrete and wall leaks. Regardless of how big or small the leak is, you should contact Rooter-Man GTA, as these leaks will eventually become larger and cause bigger issues. The foundation of your house is designed to support your home and keep out any moisture. 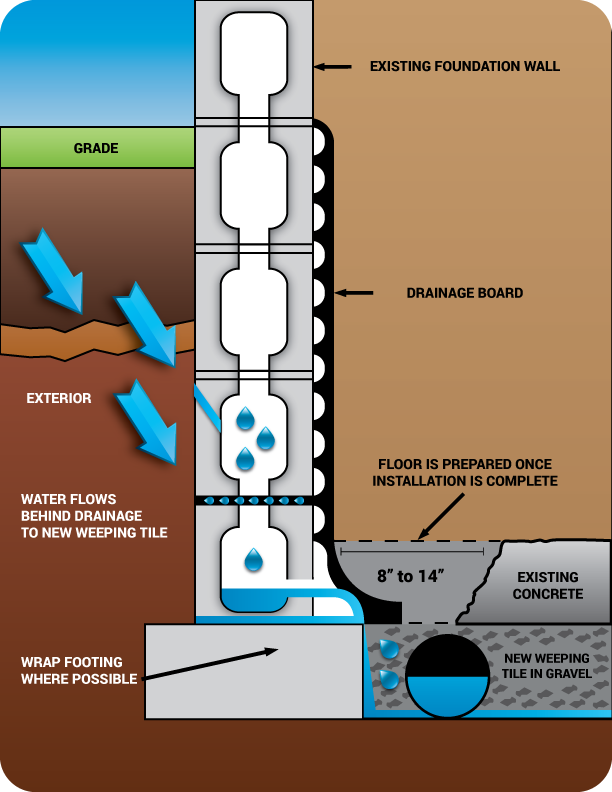 However, over time, leaks tend to develop in the foundation. This makes your home foundation weaker and lets moisture seep in, which has many negative effects to your home and your health. The moisture can cause structural issues to your home, damage your furniture, wet your carpets, and cause a foul odour to form. This all can lead to your home decreasing in value. Water leakage can also lead to the build-up of mold and mildew if left untreated, which can make your property health hazardous. Mold spores inside your home could worsen allergies and could even cause you to experience respiratory problems like asthma or lung disease. Luckily, Rooter-Man GTA has the necessary knowledge and tools to keep your family safe and healthy! Many plumbing services offer patch-work solutions, which covers rather than solves the issue. 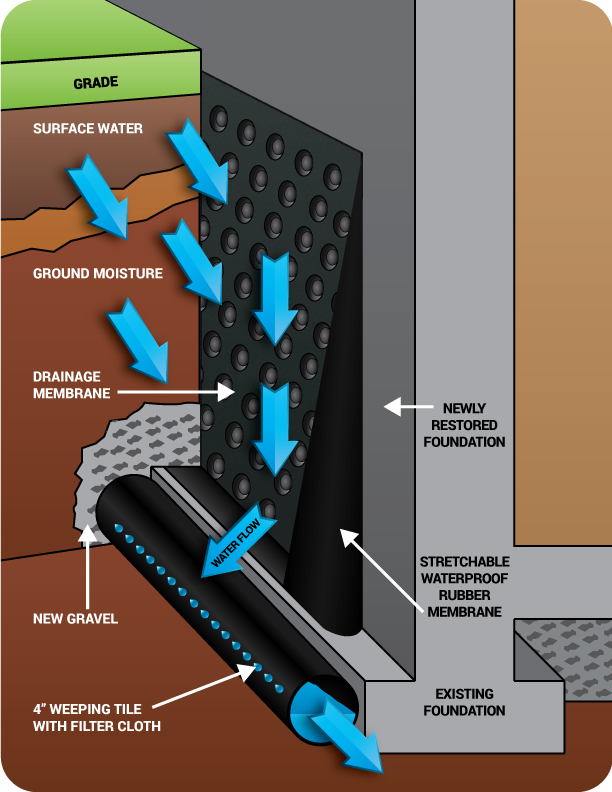 Rooter-Man GTA offers a wet basement waterproofing service that will ensure your basement stays dry for good. Being familiar to the weather conditions in the GTA including Mississauga, Vaughan, Oakville, Etobicoke, Burlington, Brampton and Toronto. Rooter-Man GTA uses waterproofing products proven by science and extensive experience that will permanently protect your home from water damage, mold, or rot, no matter how intense the Canadian weather gets. Crawl spaces in basements tend to be more prone to dampness, and therefore mold growth and wood rot. Luckily, Rooter-Man GTA has access to cutting edge technology that is scientifically proven to eliminate humidity, keep moisture out, keep bugs out, and leave you with a dry, clean, and healthy place for you and your family. If you find any damp spots in your basement, or any puddles of water on your flooring, be sure to call Rooter-Man GTA, so that you will never have to face this problem again! The service technician will perform a complete inspection of your home, including the roof, home foundation, window casings and sidings and more. Rest assured, a Rooter-Man GTA service technician will identify all the cracks in your home and diagnose the source or sources of the issue. They will then take the proper steps to prevent any future problems from occurring. You will not have to call Rooter-Man GTA more than once about your wet basement waterproofing. Contact Rooter-Man GTA today for all your wet basement waterproofing needs, and a service technician will surely be at your home or business as soon as possible to fix the problem for good.